ReThreads 2943 N. Humboldt Blvd. 414.263.1690 www.rethreadsclothing.com Hrs: 11-7 Mon-Sat 12-5 Sun by Will Mueller There is a new clothing store in Riverwest that owner Beret Isaacson says is “the only store of its type in Milwaukee,” one which buys, sells and trades clothing with its customers. 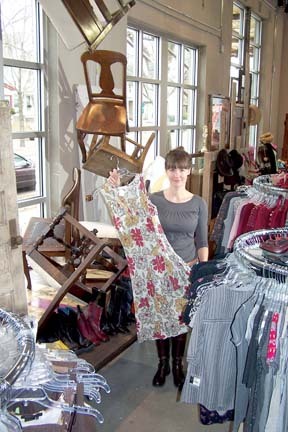 The new clothing shop, ReThreads, is located at 2943 N. Humboldt Boulevard (right next to Loop Yarn Shop). “We have a buying counter that is always open, and we buy yearround and all seasons,” said Isaacson, explaining that ReThreads buys items which are still in style and in good condition, and will buy some vintage items ranging from the 1940s to the 1970s. ReThreads will keep its focus not only on trends, but on popular brand names such as J.Crew, Abercrombie, Seven7, and Citizen. To keep the inventory fresh and prices low, Isaacson plans to discount items that do not sell after four to six weeks down to half of their original price. Those selling their items of clothing will receive compensation of 35% of the amount ReThreads will sell the item for in cash, or 50% of that price in store credit. Isaacson says the clothes go straight to the selling floor so the widest variety of inventory is available at all times.